With Summer Break upon us, what better time is there than this to encourage children to play, imagine and enjoy being a child! God created children to do all these things, so encourage their play and creative spirit and make time to play with them, because in so doing, you will make a great difference in their lives! 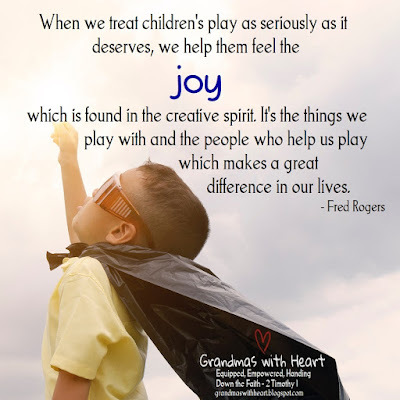 I love this saying: "When we treat children's play as seriously as it deserves, we help them feel the joy which is found in the creative spirit. It's the things we play with and the people who help us play which makes a great difference in our lives." Remember this throughout the summer as you build your relationship with your grandchildren and hand down the faith!